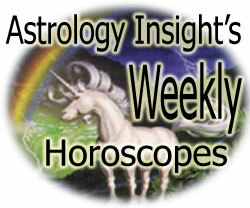 Weekly Horoscopes From Astrology Insight! We hope you enjoy these Weekly horoscopes. We would be honored if you would like to link your web site to this page. What a nice way to provide Weekly horoscopes to your visitors! Aries - March 21 - April 20 Try to be tolerant of the moods of those around you. Hassles with female colleagues may lead to problems with your boss. Try to spend more time with children and relatives. Try not to make waves. Taurus - April 21 - May 20 Your emotions may get the better of you. Your sensitive, affectionate nature will capture the heart of anyone you are attracted to. Minor health problems may flare up if you haven't been taking care of yourself or have been burning the candle at both ends. Don't make any unreasonable promises. Gemini - May 22 - June 21 Your partner may not understand your mood swings but if you are willing to communicate, a lot of grief can be avoided. Elders may get you going this week. You can make a big difference to children if you are understanding of the difficulties they are experiencing. Get the red tape and the unwanted paperwork out of the way. Cancer - June 22 - July 22 Your ability to be a self starter will help get things done and motivate others. You need to be careful not to make promises that you can't fulfill. Ask those in key positions to help you overcome the delays and to support your concerns in order to move on. False information is likely if you listen to idle chatter or gossip. Leo - July 23 -August 22 Get involved in creative projects that could turn into moneymaking ventures. Try to do your job and then leave. Take a look at investment opportunities. Real estate investments will be profit able. Virgo - August 23 - September 22 Try to spend some time on your own. Romantic encounters will develop through colleagues. You are best to avoid such unsavory circumstances, especially if you're in a group situation. Don't hold back; go with the flow and take a bit of a chance. Libra - September 23 - October 22 Educational courses will be stimulating and successful. Travel will be favorable. Resist overspending on luxury items. You need to be inspired and have your spirits lifted. You will need to do a lot of research if you wish to get to the bottom of things. Scorpio - October 23 - November 21 Your emotional stability may influence the changes taking place in your personal life. Someone close to you will get upset easily if you are insensitive to their needs. Avoid friends or acquaintances who drink too much. Rely on yourself and you will look good to superiors. Sagittarius - November 22 - December 20 You may have problems with those you live with. You can look into new jobs but don't count on getting help from someone who may have promised you assistance. Strength will come from your ability to overtake just about any one. Come to your own conclusions rather than taking the word of someone else. Capricorn - December 21 - January 19 Get busy. Your boss may not be in the best of moods this week. Don't hesitate to voice your opinions at a group meeting; however, keep your thoughts to yourself at home. Make changes in your domestic scene. Aquarius - January 20 - February 18 Older relatives may make unreasonable demands. New relationships could evolve through group activities. Be prepared to counteract the damage that adversaries are about to create. Your mind is on moneymaking ventures. Pisces - February 19 - March 20 Stick to travel or do things in conjunction with groups. Expect to have problems with the ones you love. Your interests could lead you down avenues you never realized existed. Try to get every one involved; it will help bring you closer together.